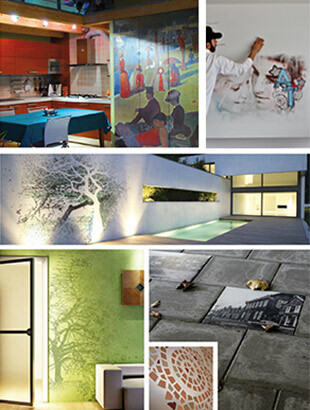 PSFRESCO12250 is a decal for walls Shock Line for decorating walls or absorbing surfaces. Not cut and peelable. Internationally patented PSFRESCO consists of a digitally pigmented sheet that shifts "only the color" directly into the pores of the surface that must be decorated without changing it’s features and integrating with any paint on it. It ensures excellent scratch resistance. The application requires a specific liquid. PSFRESCO12250 is ideal for interior and exterior walls, floors, lining, street furniture, concrete, but also for wood, marble and stone. Excellent, in general, for any breathable, not plastic, slightly porous surface.